Worksheet: Carbon Cycle & The Greenhouse Effect - AP Environmental Science! Carbon Dioxide (CO2): Is a colorless, odorless gas consisting of molecules made up of two oxygen atoms and one carbon atom. Methane (CH4): Is a colorless, odorless non-toxic gas consisting of molecules made up of four hydrogen atoms and one carbon atom. Nitrous Oxide (N2O): Is a colorless, non-flammable gas with a sweetish odor, commonly known as "laughing gas", and sometimes used as an anesthetic. Sulfur Hexafluoride (SF6): Is an extremely potent greenhouse gas. SF6 is very persistent, with an atmospheric lifetime of more than a thousand years. 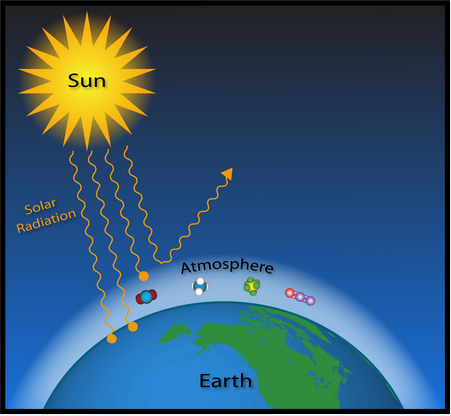 Explain how the Carbon Cycle is involved in global climate change: The carbon cycle moves carbon around between the atmosphere and the oceans, the soil, animals and vegetation. This has helped to hold the greenhouse effect in the atmosphere stable for millions of years, keeping the planet comfortably warm. What are Carbon SOURCES and SINKS? A carbon source is any activity that emits Carbon Dioxide. Sources can be stationary emitters such as power plants or refineries, or they can be emitted from activities such as driving automobiles. A forest, ocean, or other natural environment viewed in terms of its ability to absorb carbon dioxide from the atmosphere. How does deforestation increase the amount of CO2 in the atmosphere? Deforestation is the cutting down of trees to improve the value of tracts of land by making space for farms usually. Trees are a large source of oxygen and also remove carbon dioxide from the atmosphere. oceans? A companion phenomenon of emitting CO2 into the atmosphere is the loading of the oceans with elevated levels of carbon dioxide created by fossil fuel burning and other human activities. It affects the ocean by taking large amount of water and also for the living things that is living in the ocean. Since fossil fuels are ultimately derived from ancient plants, plants and fossil fuels all have roughly the same 13C/12C ratio – about 2% lower than that of the atmosphere.